No matter how ready you are for your child to sleep through the night, sleep coaching can feel like a huge leap. It’s not always easy, and requires a real commitment from you. It’s smart to be really ready before sleep coaching. Perhaps you aren’t ready for that commitment. Are you worried that your baby is not ready, and you are wondering if there are “baby steps” you can take before sleep coaching 100%? Consider some of these gentle-but-effective small steps that will help you and your baby prepare for full sleep coaching when you are both ready. Where and when your child goes to sleep, wakes, naps, and nurses or eats. How you put her to sleep at nap time and bedtime. When, how long, and how intensely she cries — is it a whimper or a full-out scream? What time she wakes in the night, what you do, and how long it takes to get her back to sleep. If your baby is under 18 months old, track their eating habits in your log, too. Include notes about when and how much your baby is eating. Are they nursing at regular intervals or sporadically? How long before bedtime do they eat dinner? How much solids are they taking in? Take your log into your pediatrician to help you determine if your baby is ready to sleep through the night without eating or if they need to keep a feeding. Consider also talking to a lactation counselor if you are concerned about your milk supply or your baby’s intake. Keep a notebook next to your bed or your baby’s bed to jot down details in the night – your paper trail will help you see your baby’s sleeping and eating patterns more clearly! Or use my free Gentle Sleep app on your phone. Once you have a clearer idea of how your child is eating and sleeping, you can start making sleep-friendly changes to their schedule. Having meals and naps at regular times send signals to our brain and body about where we are in the day — and when it’s time for lights out! Fine tuning your child’s schedule is a great way to prepare for more significant sleep coaching strategies down the road. Eating and sleeping on a regular schedule helps babies develop their internal clock. If your baby is currently eating sporadically throughout the day, consider talking to your doctor about an appropriate and flexible feeding schedule for your baby’s age. One of the simplest ways to adjust your baby’s schedule for better sleep is to get them used to waking up between 6:30am and 7:30am every day. When babies over 5 months of age are waking at different times every day, sometimes as late as 8:30 or 9:30 a.m., it throws off the entire day of naps and bedtime and confuses their internal clocks. Start waking your baby by 7:30 a.m. Then use your flexible feeding and napping schedule to guide the day and shape their internal clock. Creating predictability at bedtime is as important as in the morning. Having a soothing bedtime routine sets the stage for your child to go to sleep calmly. Aim for a 15-20 minute ritual of quiet, loving, and favorite activities to do every night before putting your baby in their bed. Three or four activities from this list should be plenty. If you are eventually going to switch your baby’s, room consider doing this soothing routine in their new room. Creating a nurturing bedtime routine is helpful even if you are planning on putting your child down asleep until you are ready to start sleep coaching. Darkness is an essential cue for the body to sleep. Combined with a soothing bedtime routine, darkness starts the body’s release of melatonin, the sleep hormone. If your child’s room is still light at their ideal bedtime or early in the morning, consider blocking out external light with shades. These can help with naps too! 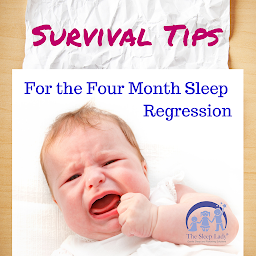 Does your child depend on you to put them to sleep? Do you have to rock, feed or lie down with your child to get them to sleep and back to sleep? If you are not ready to put your baby down awake at bedtime, but for example you would like to stop nursing him to sleep, try having dad rock him to sleep. Yes, you are creating a new sleep crutch, but your baby is not as attached to this new habit. It may be easier to stop when you are ready to start sleep coaching. Another small step you can take now is to work on gently fading out your child’s sleep crutch. For example, if you always hold your child until he’s completely asleep, try holding him until he’s almost asleep. Then put him in his crib and pat him all the way to sleep. You can also try patting him back to sleep during the night. Once you’re ready for yet another small step forward, try patting him intermittently at bedtime and when he wakes. Finally, transition to using the Sleep Lady Shuffle at bedtime when you are ready to stop patting him all together. You will know when it’s time to start full sleep coaching when your new sleep crutch stops working. An additional baby step is to work on putting your child to bed calm, but awake after a great day of naps. Fill his sleep nap tank however you can during the day. Do whatever you normally do during his nighttime wakings. Focus all your coaching efforts on bedtime only. Using all or even just a few of these baby steps will get you and your child on your way to better sleep habits. The key to successful sleep coaching is having a plan that you can stick to and be consistent about implementing. Start small until you’re ready for more! When that time comes, find more great strategies for sleep coaching naps, bedtime, and night waking at my blog, consider working with a Certified Gentle Sleep Coach in your area, or access my online resources and coaching.